The Intel Core i9-9900K 8-Core, 16-Thread LGA1151 95W desktop processor that was announced earlier this month is finally something you can walk into a store today and purchase! It’s certainly been a long and weird road to get to this point, but here we are. We’ve already covered much about the 9900K when it was first announced along with pre-orders, so we will be keeping this short and simple. 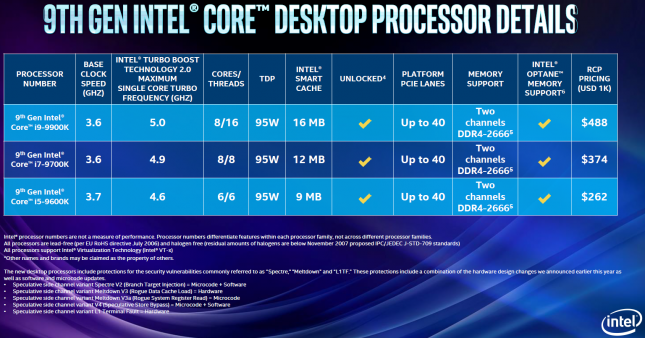 Intel is making three 9th Gen Intel Core processors available today that will work on most Intel 300 series motherboards after a UEFI/BIOS update. 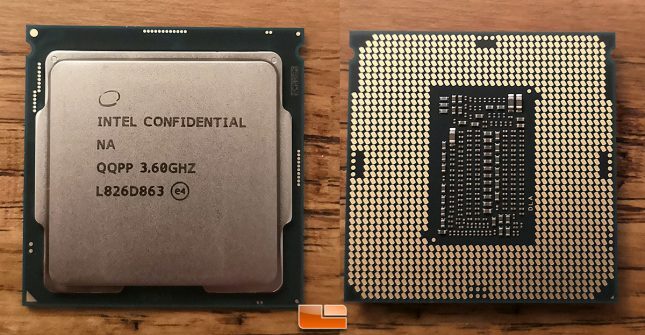 Those three processors are the Core i9-9900K, Core i7-9700K and the Core i5-9600K. 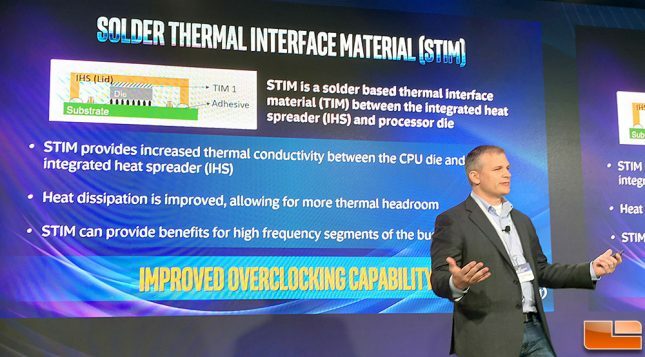 The flagship model is the 9900K with 8-cores and 16-threads and clock speeds of up to 5.0 GHz for on single-core turbo frequency. 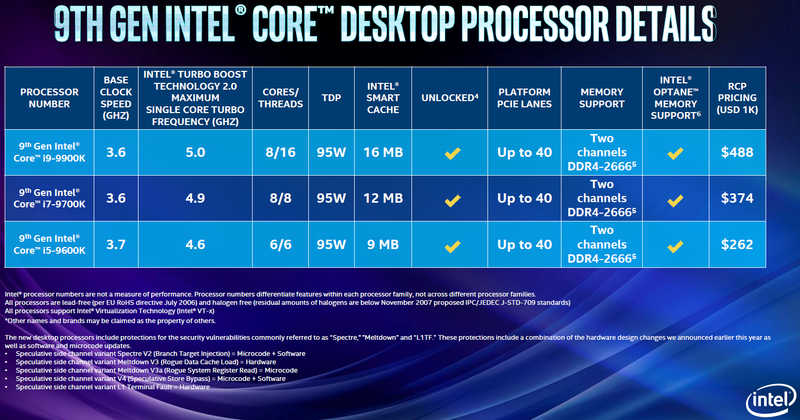 Intel is already calling the Core i9-9900K processor, the world’s best gaming processor. Pricing starts at $262 for the Intel Core i5-9600K 6-core processor, moves up to $374 for the 8-core Core i7-9700K and then tops out at $488 for the Core i9-9900K processor that has 8-cores and 16-threads. The only problem with these tray pricing figures is that retailers are selling them for over that. For example, Amazon is selling the 9900K for $579.99, the 9700K for $409.99 and the 9600K for $279.99. This is also the first series from Intel to receive silicon-level ‘fixes’ for some of the Spectre and Meltdown exploits. The speculative side channel L1 Terminal Fault and Meltdown V3 (Rogue Data Cache Load) vulnerabilities are both fixed at the hardware level now! 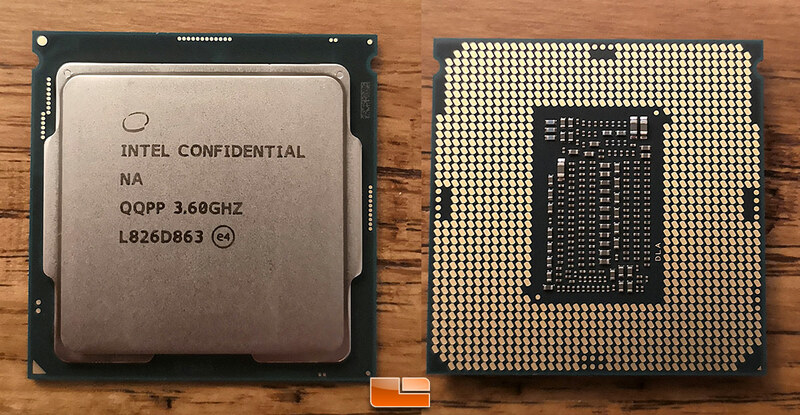 The 9th Gen Intel Core i9-9900K is a socket 1151 processor, so just like 8th Gen parts, and it will work on existing 300-series chipset based motherboards. 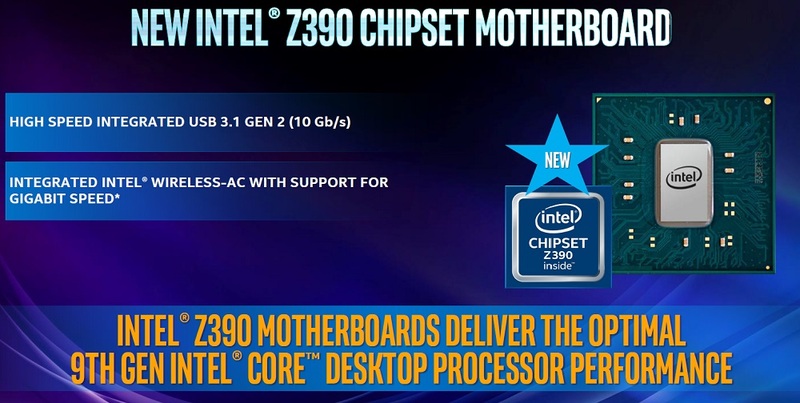 The only kicker there is not all 300-series motherboards will be getting a BIOS update to support the 9900K and many motherboard makers are not suggesting overclocking a 9900K on say an existing Intel Z370 motherboard that does have proper BIOS support. When overclocked the 8-core, 16-core beast known as the 9900K can be taxing on the CPU power design on many boards and many of the Z370 boards aren’t up to snuff. So, you’ll want to go with the the newer Intel Z390 chipset based boards to get the best possible platform for the years ahead. 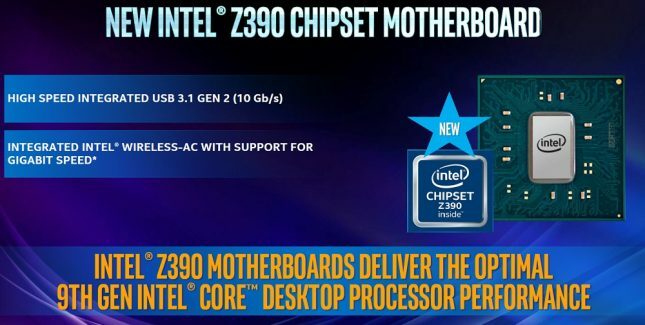 The Intel Z390 chipset brings integrated USB 3.1 Gen 2 (10 Gb/s) support along with Integrated Intel Wireless-AC to the chipset. Not all boards will be including an antenna kit and enabling Intel Wireless-AC support though as they need to hit certain price points and meet FCC compliance. To test the Intel Core i9-9900K processor we tried out the MSI MPG Z390 Gaming Edge AC ($188.99) and the ASUS ROG MAXIMUS XI HERO ($339.00 shipped ). We installed Windows 10 64-bit v1803 on both boards and performance looked great on both of them. We ended up using the ASUS ROG MAXIMUS XI HERO for our review, but will be using both here on the test bench and in future coverage. 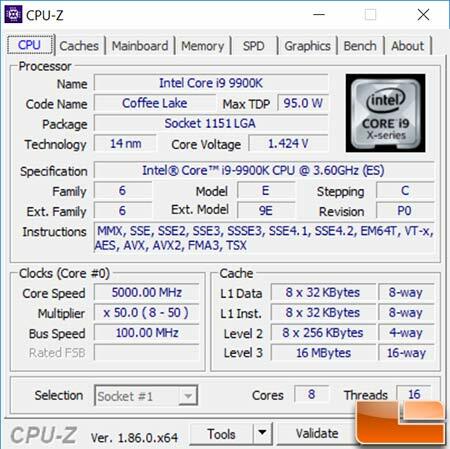 Below you’ll find a CPU-Z shot with the 9900K running at 5GHz boost under a single-core load. When running more than one thread the boost clock is usually between 4.2 and 4.7 GHz.